For other uses, see Alcyone (mythology). In Greek mythology, Alcyone or Alkyone (/ælˈsaɪəˌni/; Ancient Greek: Ἀλκυόνη Halkyónē derived from alkyon αλκυων "kingfisher") was a Thessalian princess and later on queen of Trachis. Alcyone was the daughter of King Aeolus of Aeolia, either by Enarete or Aegiale. She married Ceyx, son of Eosphorus. Herbert James Draper, Halcyone, 1915. Alcyone and Ceyx were very happy together in Trachis, and according to Pseudo-Apollodorus's account, often sacrilegiously called each other "Zeus" and "Hera". This angered Zeus, so while Ceyx was at sea (going to consult an oracle according to Ovid's account), the god threw a thunderbolt at his ship. 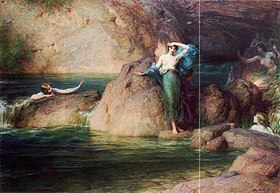 Soon after, Morpheus (god of dreams) disguised as Ceyx appeared to Alcyone as an apparition to tell her of his fate, and she threw herself into the sea in her grief. Out of compassion, the gods changed them both into common kingfishers, or "halcyon birds", named after her. 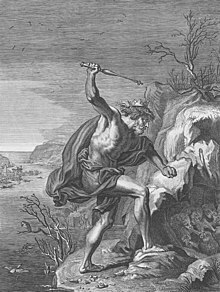 Ovid and Hyginus both also recount the metamorphosis of the pair in and after Ceyx's loss in a terrible storm, though they both omit Ceyx and Alcyone calling each other Zeus and Hera (and Zeus's resulting anger) as a reason for it. Ovid also adds the detail of her seeing his body washed up onshore before her attempted suicide. The myth is also briefly referred to by Virgil, again without reference to Zeus's anger. The legend of the halcyon’s, or kingfisher’s, nest (which has no foundation in natural history, since the halcyon does not build any kind of nest, but lays eggs in holes by the waterside) can refer only to the birth of the new sacred king at the winter solstice—after the queen who represents his mother, the Moon-goddess, has conveyed the old king’s corpse to a sepulchral island. But because the winter solstice does not always coincide with the same phase of the moon, ‘every year’ must be understood as ‘every Great Year’, of one hundred lunations, in the last of which solar and lunar time were roughly synchronized, and the sacred king’s term ended. 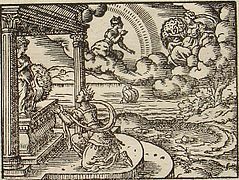 Homer connects the halcyon with Alcyone, a title of Meleager’s wife Cleopatra (Iliad), and with a daughter of Aeolus, guardian of the winds. Halcyon cannot therefore mean halcyon, ‘sea-hound’, as is usually supposed, but must stand for alcy-one, ‘the queen who wards off evil’. This derivation is confirmed by the myth of Alcyone and Ceyx, and the manner of their punishment by Zeus and Hera. The seamew part of the legend need not be pressed, although this bird, which has a plaintive cry, was sacred to the Sea-goddess Aphrodite, or Leucothea, like the halcyon of Cyprus. It seems that late in the second millennium BC the sea-faring Aeolians, who had agreed to worship the pre-Hellenic Moon-goddess as their divine ancestress and protectress, became tributary to the Zeus-worshiping Achaeans, and were forced to accept the Olympian religion. ‘Zeus’, which according to Johannes Tzetzes, hitherto been a title born by petty kings, was henceforth reserved for the Father of Heaven alone. But in Crete, the ancient mystical tradition that Zeus was born and died annually lingered on into Christian times, and tombs of Zeus were shown at Cnossus, on Mount Ida, and on Mount Dicte, each a different cult-centre. Callimachus was scandalized, and in his Hymn to Zeus wrote: ‘The Cretans are always liars. They have even built thy tomb, O Lord! But thou art not dead, for thou livest for ever.’ This is quoted in Titus. Pliny, who describes the halcyon’s alleged nest in detail—apparently the zoophyte called halcyoneum by Linnaeus—reports that the halcyon is rarely seen, and then only at the two solstices and at the setting of the Pleiades. This proves her to have originally been a manifestation of the Moon-goddess, who was alternately the Goddess of Life-in-Death at the winter solstice, and of Death-in-Life at the summer solstice; and who, every Great Year, early in November, when the Pleiades set, sent the sacred king his death summons. Still another Alcyone, daughter of Pleione (‘sailing queen’) by Atlas, was the leader of the seven Pleiades. The Pleiades’ heliacal rising in May began the navigational year; their setting marked its end, when (as Pliny notes in a passage about the halcyon) a remarkably cold north wind blows. The circumstances of Ceyx’s death show that the Aeolians, who were famous sailors, worshipped the goddess as ‘Alcyone’ because she protected them from rocks and rough weather: Zeus wrecked Ceyx’s ship, in defiance of her powers, by hurling a thunderbolt at it. Yet the halcyon was still credited with the magical power of allaying storms; and its body, when dried, was used as a talisman against Zeus’s lightning—presumably on the ground that where once it strikes it will not strike again. The Mediterranean is inclined to be calm about the time of the winter solstice. Ceyx/ Morpheus appears to Alcyone, engraving by Virgil Solis for Ovid's Metamorphoses Book XI, 650-749. 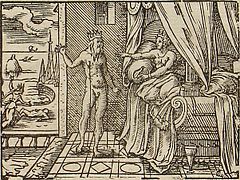 Ceyx/ Morpheus appears to Alcyone, engraving (or etching more likely) by Bauer for Ovid's Metamorphoses Book XI, 633-676. The kingfisher family Halcyonidae (tree kingfishers) is named after Alcyone, as is the genus Halcyon. The belted kingfisher's Latin species name (Megaceryle alcyon) also references her name. Their story features in The Book of the Duchess. A collection of Canada's celebrated nature poet, Archibald Lampman, Alcyone, his final set of poetry published posthumously in 1899, highlights both Lampman's apocalyptic and utopian visions of the future. TS Eliot draws from this myth in The Dry Salvages: "And the ragged rock in the restless waters,/Waves wash over it, fogs conceal it;/On a halcyon day it is merely a monument,/In navigable weather it is always a seamark/To lay a course by: but in the sombre season/Or the sudden fury, is what it always was." Rick Riordan's The Demigod Files had a part called "The Diary of Luke Castellan" which mentions a similar character named Halcyon Green who is the son of Apollo and is currently under "house arrest" for revealing to a woman her fate. Alcyone (Pleiades), one of the seven sisters Pleiades and the named after her brightest star (also known as Eta Tauri) in the Pleiades star cluster. ^ Virgil Georgics i. 399 - "[At that time] not to the sun's warmth then upon the shore / Do halcyons dear to Thetis ope their wings"
^ William Smith, ed. (1867). Dictionary of Greek and Roman Biography and Mythology. Volume 1. p. 108. It was fabled, that during the seven days before, and as many after, the shortest day of the year, while the bird ἀλκυών, was breeding, there always prevailed calms at sea. ^ Robert Graves (1960). The Greek Myths. Harmondsworth, London, England: Penguin Books. pp. s.v. Alcyone & Ceyx. ISBN 978-0143106715. Publius Vergilius Maro, Bucolics, Aeneid, and Georgics of Vergil. J. B. Greenough. Boston. Ginn & Co. 1900. Online version at the Perseus Digital Library. This article incorporates text from a publication now in the public domain: Smith, William, ed. (1870). "Alcyone" . Dictionary of Greek and Roman Biography and Mythology. Wikimedia Commons has media related to Ceyx and Alcyone.